Emphasize the words in italic. Substitute each other’s names in for the blanks. One: Hey, ________, you ready to go? Two: Yes, today has been a lot of fun, and I was thinking that we (looking off as if distracted) should try to do this again, maybe next– (excitedly) hey look over there! One: ________ we really shouldn’t! Two: ________ it is only an ice cream shop. One: But what is in the ice cream shop? One: Yes! I’m feeling just fine, and yes I am aware there is ice cream in this ice cream shop! But I don’t think it is a good idea to be looking at all this ice cream? Two: Look ________, just because we are on that sugar busters diet, doesn’t mean we can’t look at the menu, right? Two: Look! They have homemade vanilla, and double chocolate rocky road, and mocha almond fudge! One: (starts looking around) –but we really shouldn’t be looking at this (something catches One’s eye)–hey there is Pralines and cream, that has always been my favorite, and it is right next to chocolate peanut butter, which is right next to super-duper, triple-ripple, double-dipped, chocolate peanut butter fudge! Yummy! (realizing what has is happening) — what am I doing? ________ we have to stop looking all this ice cream! Two: –Oh look, there is Heavenly Hash, you know how long it has been since I have had that flavor? One: ________ are you even listening to me? Two: Yes, but I can’t help it! Maybe I’ll just get one of the free samples Yea, I need one of those little pink spoons. Yes, just a little sample! Two: With a name like Heavenly Hash, it can’t be all bad! I don’t think a sample will be enough! I think I want a scoop. Yes, yes, a scoop on a sugar cone! I can already taste it in my mouth! One: No! (grabbing Two) You can’t! Two: Why can’t I? I just want one little tinny, little bitty, small scoop of ice cream, on a little mi·nute sugar cone. Two: (pauses) But, I really want… (hesitates & thinks to himself) but I, uh, yea, I am. (sheepishly, sitting down) Wow, I guess I sort of forgot for a second or two. One: (joins him sitting) Now do you see why I think it would have been a better idea if we would not have even looked at the menu? Two: (pauses to think) Yes, I guess you have made your point. Two: But it was only ice cream? One: But like the ice cream that was temping us, there are things in our lives we watch, hear, read, and are told that may tempt us to sinning. Two: (catching on and adding to the statement) And they can cause us to gossip, be greedy, envious, prideful, or fall into lust. Like we were lusting after that ice cream. One: Yes! And once we have tasted a little bit, we want more. One: So I guess we shouldn’t even look at the menu when we are on a diet. Two: You are right, and we aren’t just talking about ice cream we should stay away from. Let’s get out of here. Man: Love… we all want to be loved… and we all want to love someone. But what is love? What is true love? Woman: The Bible tells us in 1 Corinthians 13 what true love is and how true love should act. Ask yourself if show this kind of love to your spouse. Girl: If you are dating someone, ask yourself if he shows you this kind of love. Boy: And if she shows it back? Let us demonstrate what we mean. Woman:	I understand you can’t afford to take me to Red Lobster like George is taking Emily. Burger King is fine. Girl:	He does not boast, he is not proud. He is not rude, he is not self-seeking. Boy:	I really need to study for Friday’s English test, but if you don’t understand your Algebra, I’m sure I can make some time to help you. Man: She is not easily angered, she keeps no record of wrongs. Woman:	Your have to work late again? (pause) That’s ok, I know you are trying to meet your deadline. After your deadline maybe we can do something special together. Boy: but rejoices with the truth. Girl: always hopes, always perseveres. All:	(Each other’s name) never fails. Boy:	This definition of Love is the ideal love. Man: Realistically, we are human and we are going to fail. Girl: And seek someone who is doing the same. Woman: He is not proud. Boy:	He keeps no record of wrongs. Man:	God does not delight in evil, but rejoices with the truth. Woman: We ask you to think about who you love? This sketch may be used freely. No copies should be sold to anyone else. Visit www.nealbreeding.com for more drama. You’ll find your favorite hilarious flash animations like ‘This Land’, ‘Big Box Mart’, ‘2-0-5’, ‘Good to Be in D.C.’ and more – we’ve got more over-sized pumpkin heads and dancing politicos than you can shake a stick at! If you haven’t seen any or all of them, I recommend wasting a morning or an evening and viewing them. Recently JibJab started a new service that lets visitors design their own JibJab videos and even include their own “heads” into the videos. I’ve had entirely too much fun with this new service, usually at the expense of others! 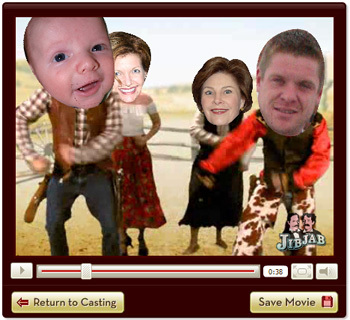 In the latest, Caden has learn to square dance with no other than Laura Bush! The other two characters are my sister and brother who have given up disco for square dancing! Performance directions: The song is sung one time through, then each boldfaced line is sung followed by the comments. At the end, the actors should ask the audience to sing along with them and exit while the audience is singing. If more than one actor is used, all actors can sing together. Individual actors can take turns saying the spoken lines. The whole cast can sing the sung lines. Jesus We are speaking about Jesus, the son of God; who became human like you and me but lived a sinless life while He was here on earth. loves me He not only love me, but He loves you (pointing at different members of the audience), and you, and you, but not just you, and you, but He loves all of us! this I know I know this for a fact. Not just up here in my head, but down here, in my heart where it counts and where I will never forget. Little ones, to Him belong â€“ We donâ€™t just be little babies because we all start out that way, but once we ask Jesus into our heart, we become babies again, but we are spiritual babies that belong to Him. they are weak but He is strong Although we might be weak when we first become spiritual babies, Jesus is strong. Stronger than the Incredible Hulk, Superman and every other Super Hero combined! And that is pretty strong! (pause if there is laughter) When we rely on His strength, we grow stronger. Yes Jesus loves me the Bible tells me so. (as the audience begins to sing, actors exit the stage). I was lucky enough to not only write a few over the years, but to even have them published in the National Drama Service publication which Lifeway published.